Spent the morning tidying up, then went out for lunch at Comptoir Libanais and did a bit of furniture shopping. Had haggis, neeps and tatties for dinner. This week on my weekly morning off with Erika we went to the zoo. Made tapas at home for me and Erika whilst Chie was out for the evening. Had some of the afternoon to myself - went for Sunday lunch, then back home to catch up on some domestic chores. Erika's friend Sophie came to play in the afternoon. A propos nothing had some (read: too much) Champagne at work, with some of the usual suspects. Went and bought a bottle of Cocchi vermouth after work and tried it in a Negroni, accompanied rather classily by some Wotsits. Erika went for an EEG this morning, which being roughly in the same part of town as my office, meant she came to see me both for breakfast and lunch. Chie went out with a friend from work, so it was just me and Erika at home this evening. Also I bought her a proper duvet for her cotbed in the daytime. Bought a steam cleaner to clean the Persian rug, and finally brought it back from my office where it I'd been storing it since I bought it. A very quiet birthday celebration this year - just the three of us - went for pizza at Rossopomodoro in Camden. Out in the garden for a bit in the morning, then into the centre in the afternoon to do sofa shopping, and look at dining tables. Erika had a bad night last night, so we decided we ought to take her to the doctor today. This was a bit touch and go as we'd only just registered at the new surgery this week, and weren't sure if we'd be "on the system" yet - but fortunately we were. I volunteered to take her so Chie could go to work. The doctor listened to her chest, I explained her history of chest infections, but she decided it wasn't an infection this time, just a bad cold, and it should clear up in a couple more days - it turned out she was right, which was a relief. Maybe doing away with the carpets in the new place had made a difference after all? Also whilst out this morning I bought Erika a pair of dungarees, which she seemed to like in the shop, but was very reluctant to actually wear once we got back home. I dropped Erika off at nursery in the afternoon, and I worked from home for the remainder, but then went and picked her up quite early as I had the feeling she'd be quite tired and probably needed a bit more rest. Picked up a bag of Frazzles at the office today. Erika managed a half day at nursery again, just the afternoon (which is the normal routine now), but wasn't 100% still, and was quite unwell in the evening - we'd thought she'd been getting better the past couple of days, but seemed to have a bit of a relapse. So we decided we should probably take her to the doctor tomorrow. Erika seemed a bit better today, but anyway under normal circumstances in the new scheme of things Wednesday mornings I when I stay home to look after Erika as she only goes to nursery in the afternoons. Our new doorbell arrive this morning, which Erika enjoyed playing with. After the deliveries had arrived we went to Hamley's to get her a half birthday present (a day late). Just before Christmas it had worked really well to take her to the toy shop and let her choose a present - she picked a shopping trolley which she still plays with a lot. Today though she seemed very indecisive and couldn't really settle on any one thing. So in the end I decided to get her some Sylvanian Families pandas (she already has some Sylvanian Families things from Auntie Yuka) which, since then, she has actually played with quite a bit. After that, we went to Tibits for lunch, which had worked very well last time, but this time she barely ate anything. Perhaps because she still wasn't feeling quite 100%. I decided to try and take her to nursery in the afternoon, but not sure in hindsight if she was really up to it - she definitely protested quite a bit, but I've missed so much time at work the past few weeks with the move and her settling in period that I was really determined she should go. In the evening I remembered I'd organised welcome back drinks, for a colleague who'd left the company and rejoined - but seeing as I was so behind on work I pretty much told everyone else to go without me, and I just poked my nose in briefly at the end. The rest of them had chosen to go to the Cask in Pimlico, one of my least favourite places, so I hadn't exactly missed all that much. Today was Erika's two and a half birthday, but as she was a bit under the weather we thought we'd delay the usual mini celebration until she was better. Today we swapped round, I went to work in the morning, and Chie went to work in the afternoon. Erika perked up enough in the afternoon to go to the playground in Tufnell Park for a bit. We also found another slightly nicer looking playground round the corner from there (Foxham Gardens? ), but it appeared to be closed for rennovation, which was a shame. Erika had been feverish last night, and was again this morning, so we decided she'd better not go to nursery, and we decided to split the day up - I'd look after her in the morning, Chie would take over for the afternoon shift. We just popped out briefly in the morning to buy things to make tomato and lentil soup with pasta in (round, wheel shaped pasta). One of Chie's "mamtomo" (a friend who is also a Mum) was in the area with her little girl today, so the four of them went off for lunch, leaving me to my own devices for a bit. I decided to try lunch at the Junction Tavern, having walked past a few times and not particularly fancied the sound of the vegetarian option on the menu I was pleased to see a "leek and cep pie" which was just about right for a Sunday lunch. I sat by the open fire, and noticed on the menu they suggested a glass of sherry to start, which was very civilised, and all in all it made for a pleasant lunch. Went back to the flat after that, having picked up some macarons in a nearby bakery for teatime, and tidied up a bit ahead of Chie's friend coming round. We all had tea together. The macarons were not that great. Did some gardening with Erika in the morning, tending to the plants we'd planted the other day (some rosemary, some oregano, and some heather, because it's Latin name is Erica!). The weather was quite nice today, for the first time in what seemed like weeks, so we determined to go out for a picnic. We'd vaguely thought about heading to Hampstead Heath, but I slightly miscalculated which direction it was in, having planned to go buy way of the little Oriental food shop I'd discovered last night, which I noticed sold bentos. That was a bit of a mistake, the food was pretty dire - all dried out and gave the impression it had been sitting around for some time. We didn't quite make it to the heath either, stopping instead in Dartmouth Park, which is a funny sort of park - a steep incline on one side, then a closed off bit I assume to be a reservoir or something at the top, with a view which in the distance took in some of the London skyline, but in the foreground is mostly a rather grim looking estate. Erika played in the playground there afterwards which cheered us up slightly. Rather than go back the way we came, we turned it into a bit of a circular walk, and skirted along the Southern edge of Highgate cemetery which is an interesting, if slightly weird area. We were back at the flat by about 2:30, and spent the remainder of the day there, sorting through boxes etc. The moving people came towards the end of the daytime to take away the majority of the boxes (alas we couldn't get rid of all of them, as we didn't have any cupboards in the bedrooms yet) - and perhaps more importantly, the big pile of packing paper which had been gradually consuming most of the lounge floor. That felt rather good - so much so we had Champagne with dinner to celebrate. Did a bit of shopping around Kentish Town on the way back from work, went into the mediteranean supermarket / deli place there. Was pleased to find a lot of the same middle eastern things we used to buy in the little Middle Eastern shop round the corner from us in Pimlico, (foul medames, falafel, etc) but everything seemed to be about twice the price! 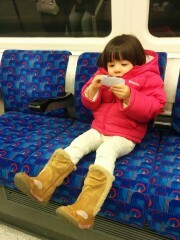 Got the tube to Holloway Road after work to go to the Waitrose there, where I met up with Chie and Erika. Erika's new nursery schedule seems to mean so far she hasn't been having her usual afternoon nap, and it's become not uncommon for her to instead fall asleep around 5:30 after she leaves. Whilst this doesn't really seem ideal in terms of her then going to bed at a sensible time later on in the evening, on this particular occasion it was convenient as we could then do shopping in peace. We bought quite a lot - about a hundred quid's worth - which is pretty rare for us - and therefore decided it made sense to get a taxi on the way back. They're a bit few and far between here in the North compared to what we were used to when we lived a lot more centrally, but Holloway Road is a big enough artery that we didn't have to wait too long. Although, having got used to telling taxi drivers our address and them always knowing where we meant from our time in Pimlico, it was a further reminder of being out in the sticks when the name of the road we now live on met with "where's that?". I forget exactly what we had for dinner, but the starter was Marmonde tomatoes with mozzarella. Bought a Persian rug whilst looking after Erika this morning. I decided to go for the "antique" Isfahan I'd seen in the window the other day - at least partly because it was already a bit worn out in places, and therefore relatively cheap, and so I wouldn't have to worry about us causing further damage to it. Erika had a little roll about on it when we got it home, which I took to mean that she approved. I dropped Erika off at nursery in the afternoon - Wednesday are, from now on, down to me to look after her in the morning, and then she goes to nursery in the afternoon, with the plan being I'll stay late in the evenings at work to make up the time - this actually works out quite well for me as it's a good chance to fit in meetings with the US. Later on in the evening some friends from work came for an introductory tour of my new neighbourhood, taking in three pubs (the Assembly House, which nobody particularly liked, the Pineapple which met with moderate approval, and the Southampton Arms, which was a huge success) - followed by a quick dinner at Dirty Burger, then cocktails to finish at Ladies and Gentlemen, a cocktail bar in a disused public toilet. Of course. Hina Matsuri (girls day) in Japan, so Chie made Japanese food for dinner. Today was Erika's first full day at her new nursery without either of us sticking around. I managed to drop her off in the morning without too much protest, which was encouraging, and got to work at a fairly respectable time. Nabe for dinner. Not much else to report! Went to look at a Persian rug briefly in the morning before going down to Clapham for the afternoon to visit a friend of Chie's from work who has a similar age daughter to Erika. She's Indonesian, so we had an Indonesian fried rice dish for lunch, which was interesting - while the girls, sitting on a cute little dining table of their own, had macaroni cheese. Erika ate really well - she always seems to eat better when there's other kids around.